I am responsible for fundraising here at the Gate. 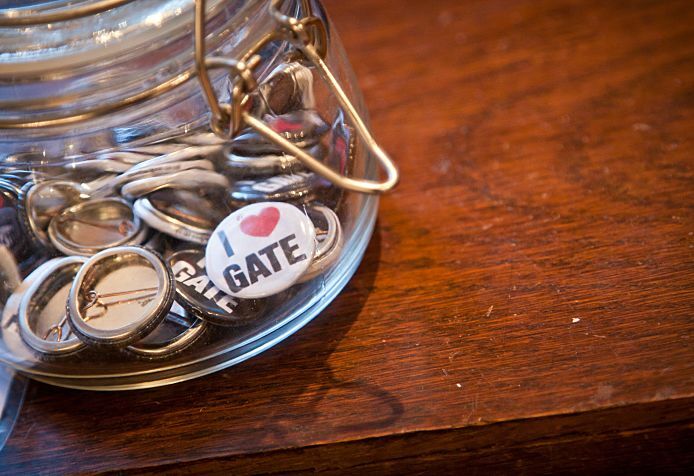 The Gate is a registered charity and reliant on the generosity of our Supporters. We need to raise £225,000 a year from private sources and without any support our ticket prices would be an eye watering £55ish. On a day to day level I look after our lovely Supporters, Trust and Foundations and Corporates. It’s a fun mix of problem solving, pitching, writing, talking and quite a lot of coffee drinking. As a child I dreamt of becoming a Blue Peter presenter. I’m not sure if they’d have Blue Peter in an alternate universe though! I think my answer probably depends on who I’m talking to. I saw The Plough and the Stars co-produced by Abbey Theatre at the Barbican when I was a teenager and it was that production that made me want to work in theatre: it was enthralling, gripping, engaging and moved the text in to something heart-wrenchingly wonderful. In terms of sheer drama I loved the National’s version of His Dark Materials – it was just such an epic performance. But if you know me really well you’ll know I’m terribly passionate about Polish theatre – I couldn’t speak for the rest of the evening after I first saw Caesarean Section by Teatr Zar in a warehouse space outside of Krakow. I’ve seen it three times since and have been notably moved every time. It’s harrowing, indescribable and totally mesmerising. They come to the UK every couple of years so you don’t just have to catch them in Poland! I think I’d join the cast of Teatr Zar – they live in community creating their work deep in the heart of the Polish forest – I’m not sure I’d last more than the day though! Theatre is challenging and inspiring. Theatre has the capability to change hearts and change the world. There is no other art-form that is able to capture the heart and minds of thousands of people in such an intimate and emotionally engaging way. We take theatre so much for granted in the UK but without the bedrock of funding that the theatre community receives it would be a culturally stunted, commercially drained resource that would be forced to stop taking risks, stop striving for diversity and stop prioritising beautiful, challenging work. Array (  => Array ( [id] => 73 [created] => 1434711900 [updated] => 1434711900 [ordering_count] => 66 [intro] => This week, get to know our Development Manager Fiona English. [title] => Interview with: Development Manager Fiona English [slug] => interview-with-development-manager-fiona-english [category_id] => 12 [body] => Tell us a bit about your job at the Gate?